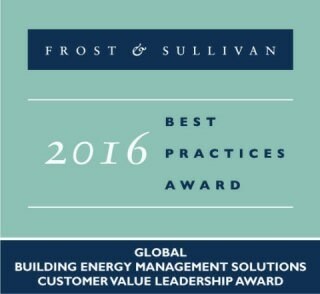 GridPoint—an innovator in comprehensive, data-driven energy management systems (EMS) that enable customers to optimize energy savings, facility efficiency, and sustainability efforts, today announced that it had been named the winner of Frost & Sullivan’s 2016 Customer Value Leadership Award for building energy management solutions. This award is given to a company that consistently deepens customer relationships by offering superior products and services that deliver a clear, demonstrable return on investment (ROI). GridPoint’s unique energy management solution includes granular submetering and monitoring, intelligent control, cloud-based software, and professional services that generate energy, operational, and maintenance savings up to 30%. Customers lower their utility bills by collecting and analyzing site data to intelligently control critical building systems without sacrificing customer comfort. GridPoint’s extensive dataset and decision support tools enable customers to diagnose malfunctioning equipment, prioritize asset maintenance, and assess the financial benefits of energy efficiency projects with confidence. For this award, Frost & Sullivan analysts independently evaluated two key factors across the nominees: customer impact and business impact. These evaluations are then put into a Decision Support Scorecard, which benchmarks the criteria and identifies positions on a 10-point scale. GridPoint received the highest rating of 9/10, a full 3.5 points higher than its closest competitor who received a score of 6.5/10.